Gorilla Forest Camp is a luxury tented camp perched on the side of a mountain in the Bwindi National Park. Apoka Lodge is in the heart of Kidepo Valley National Park, tucked into.. Deep in the heart of Uganda's Western Rift Valley, the Semliki Valley is a prime conservation area. As the name implies, you feel on top of the world from your first gaze across the landscape that simply..
Mount Gahinga National Park is in the far south west of Uganda close to the borders of both Rwanda and Congo. Volcanoes Lodge at Bwindi is on the edge of Buhoma village alongside Bwindi Impenetrable National Park..
Virunga Lodge is set on a high hilltop with breathtaking views of the Virunga volcanoes and Lakes Ruhondo and Bulera. The lodge is only minutes away from the headquarters of the Parc National des Volcans ..
Few animals have sparked the imagination of man as much as the gorilla, the largest of the living primates. Most gorillas live in inaccessible regions in various dense forests in tropical Africa, and one subspecies, the mountain gorilla (Gorilla beringei beringei), was not even known to science until 1902. The mountain gorilla has a robust build with long, muscular arms, a massive chest, and broad hands and feet. It is the hairiest race of gorillas; its long, thick black hair insulates it from the cold of living at high elevations. The world's remaining mountain gorillas live within four national parks, split in two regions that are 45 kilometers (28 miles) apart. One population of mountain gorillas inhabits the Bwindi Impenetrable National Park in Uganda. A census in 2003 recorded 340 gorillas here. The second population of mountain gorillas is found in a mountainous region referred to as the Virungas, which includes Mgahinga Gorilla National Park (Uganda), Volcanoes National Park (Rwanda) and Virunga National Park (Democratic Republic of Congo). Approximately 380 gorillas are found in the Virungas. formerly Albert National Park, in northeastern Democratic Republic of the Congo (Kinshasa) was created in 1925, it has an area of some 3,050 square miles (7,900 square km) and contains a vast diversity of habitats. The park's southern tip rests on the northern shore of Lake Kivu, a short distance from the town of Goma to the east. 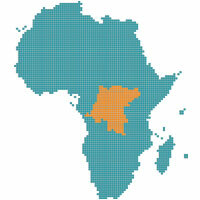 The Virunga Mountains lie between Lakes Kivu and Edward and extend into Rwanda and Uganda. The great volcanoes of this range, clothed in cloud forests, include the dormant Mikeno, Karisimbi, Visoke, and Sabinio (Sabinyo), as well as the active Nyiragongo and Nyamulagira. Farther north are the Rutshuru Falls and the Mai ya Moto sulfur springs. Much of the park's central region is occupied by Lake Edward. To the northeast the Ruwenzori Range soars to more than 16,000 feet (4,880 metres). The park is home to abundant wildlife, including elephants, whose numbers decreased in the late 20th century, and lions, who have increased in number, unlike most other large mammals. Hippopotamuses, rare mountain gorillas, okapis, antelope, warthogs, and pelicans all live in Virunga as well. We are partnered with adventure-travel.co, the global adventure travel resource.